The Swope, Rodante Vanguard Award, founded in 2011, recognizes outstanding high school student athletes and coaches throughout Hillsborough County. The award program is proud to celebrate these students and coaches who work with integrity and dedication in an effort to have a positive impact on our community. Each month of the school year, the award program selects a Student Athlete of the Month who excels in academics, athletics and in the community. The winner is presented with an award as well as a $1,000 check to be donated to the school’s athletic department on the student’s behalf. 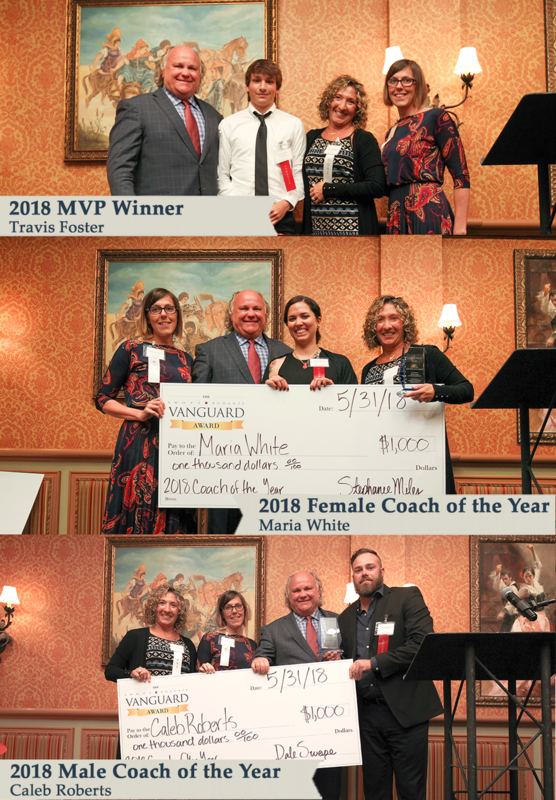 At the end of every school year, The Swope, Rodante Vanguard Award hosts the End of the Year Awards Banquet, a celebratory event for student athletes, coaches, city officials and families to enjoy. During the ceremony, one overall Student Athlete MVP is awarded. That student receives a special gift to use during college. The selection committee also recognizes two coaches (one male and one female) with the Coach of the Year Award, honoring their outstanding contributions over the previous year. Each winning coach receives a $1,000 check. We encourage members of the community to make a difference by nominating a Hillsborough County student athlete or coach. Each month of the school year, the Swope, Rodante Vanguard Award selects a Student Athlete of the Month from Hillsborough County who excels in athletics, academics and in the community. The winning athlete receives an award and a $1,000 check donated to the school’s athletic department in honor of the student’s outstanding performance. At the end of every school year, during the End of the Year Awards Banquet, the selection board awards one overall MVP Student Athlete who receives a gift to use for college.We encourage you to nominate an exceptional student athlete today!When submitting nominations remember: the student must meet all the requirements, each submission is only considered for the current month, and you can re-nominate a student, but this does not mean the student will be selected as student athlete of the month. The dedication of Hillsborough County coaches is crucial to the development of local athletic programs and the success of student athletes. The Swope, Rodante Vanguard Award is proud to recognize this commitment with the Coach of the Year Award. The award is presented to one male coach and one female coach during the End of the Year Awards Banquet, as well as a $1,000 check to each coach. We encourage you to nominate coaches who you feel have left a lasting, positive impact with the school and or the school’s student athletes.When submitting nominations remember: a coach cannot nominate him or herself, a coach can be nominated more than once, and you must include the reason why you believe this coach deserves Coach of the Year.